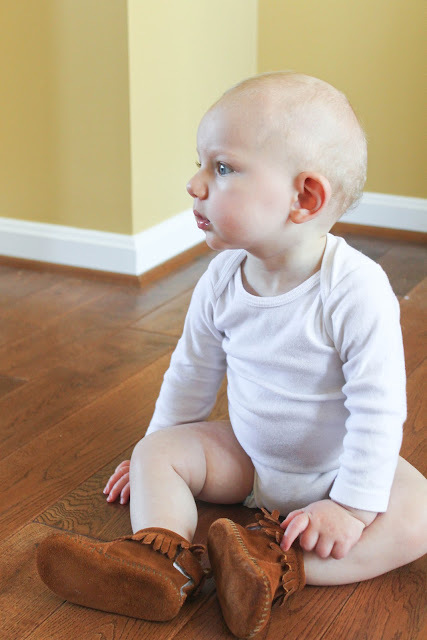 We can thank my Mama, Gammie, for Carter's fine choice of footwear for today's Wee One Wednesday. We scooped up these baby moc's from one of our absolute favorite places to shop, hanna andersson. Yes, it's Swedish and yes, it's stinking adorable. It's true. Sometimes, I like to dress C as if he's a tiny Swedish hippie baby. No lie. Speaking of Gammie, we'll be leaving the sweet state of Maryland behind today as we head North to Hometown, New Jersey to wait for the Easter Bunny to visit Carter! Growing up, I would always leave carrots out for The Bunny the night before Easter and wake up to powder bunny prints leading from the entryway of our home clear through the house to where our baskets lie. I have a funny feeling those powder prints will be making their first appearance in many, many years this year! I can't wait! Don't fret, ILYMTC blogging to continue from the comforts of Gammie and Poppy's place! Happy Wednesday, Loyals! I hope you have a great Easter with your family! We left carrots out too. The hubs thought I was crazy (um MIL Fail?) when I mentioned it. What a cute tradition and what an adorable little boy! Oh I Love Hannah Anderson and those moccasins!! fabulous! Happy Easter! Love the carrots and powder bunny prints...that is so cute! Have a great time at home and Happy Easter! So cute. Enjoy your trip home! How long is the ride for you to jersey? Hopefully its not too long! ohmysweetness I just want to hold him!!!! 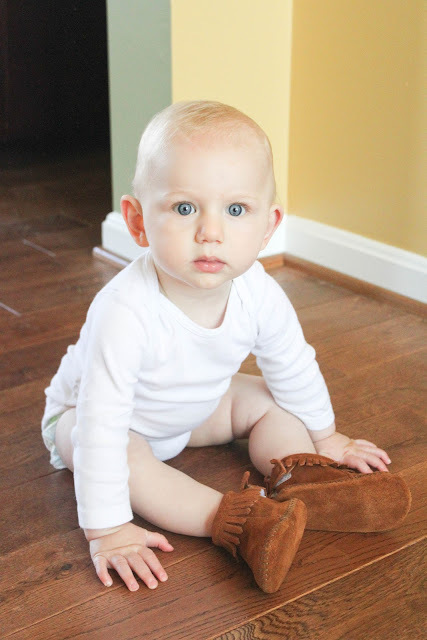 he's adorable in his mocs! And I LOVE the Easter Bunny prints! How cute is that?! I love Hanna Anderson! I have so much fun looking through kids' clothing catalogues when I babysit! He is the cutest thing! We LOVE Hanna Andersson too!